My love and appreciation of Windir are limitless. They are probably the only band I dedicated time to cover just about the entire discography on these pages. When Valfar tragically passed away I was devastated by the news. So from there on out I have been searching for something to fill the musical void Windir left behind. Turns out to find that missing piece all I had to was to seek in the same Sogndal land. Sure, Oliver Oien is more Johan Hegg than desperate pleas of Valfar, and Mistur incorporates more of melodic death tendencies than pure folk self-abandonment in their music than Windir (I can hear some of the old Insomnium on In Memoriam). Yet songs like Downfall or Distant Peaks, I am sure Valfar is smiling from the place high up above.Downfall and Distant Peaks proceed almost on opposite tracks , Downfall beginning more atmospheric and arriving to blasting in the end, while Distant Peaks starts out with forceful rhythms going to dreamy "distant peaks" and full dissolution around 3'30". Then there are longer tracks, not that 6-7 minutes long Downfall and Distant Peaks are short. For 10-11 min long Firstborn Son, Matriach’s Lament and The Sight I can't possibly remember all of the developments, but can certainly revel in many moments, like opening militaristic riff of Firstborn Son or melodic brooding and chuga-chuga close of The Sight. Not everything sits with me completely well, a deathcore breakdown or mid-song black'n'roll in Firstborn Son are brow raising , but on Matriarch’s Lament everything just comes together. Tender, dramatic, with guitars out of this world and triumphant concluding solo, keyboards around 4'30" are total Heidre from 1184. Closer Tears of Remembrance is a melodic crowning achievement, from pure piano opening to main riff to arpeggiated heroic sweeps to the sense of finality around 7'50" and closing 3 min long solo. And why not when you have Stian Bakketeig, aka Strom from …, you guessed it, Windir and Vreid fame playing lead guitar. 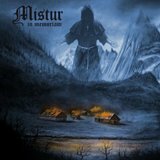 Borrowing some from melodic death or sounding like slower less refined Amon Amarth at the end of Firstborn Son, Mistur are first and foremost representatives of the Sogndal area in Norway, and that is why they hit such a strong chord in my heart with In Memoriam.